This extremely nice one owner unit Just came in and it is in like new condition throughout. 1998 Toyota Camroad Lotus model. This is their top model in the Camroad series in that year. One lady owner that took meticulous care of it. Only 47,000 Klm,s Auto diesel engine is very smooth and responsive. triple air con. Roof central and dash air. power windows central locking abs bunk bed at back and another fold down bed above that. Massive amounts of interior and external storage including a rear extra garage type storage area. Deluxe woodgrain dash area Height adjustable steering column power mirrors that automatically fold in if needed adjustable reversing camera with built-in backing monitor deluxe body graphics Heavy duty suspension package Multi adjustable lounge seats that turn into a large bed. These seats can move sideways flat or face forwards/ Backwards. Very comfortable with extra thick cushions including the upper bed area. The upper bed has an extra storage area below the cushions. This is a very large King size bed with pop-out ventilation windows either side. You can sit upright in this bed if you are less than 5ft 7inch. the top bed length is 190 cm and 150 wide. On-demand instant water heater Automatic diesel heater for the living area.Large Kitchen area with dual sinks and plenty of work space, Nice Bathroom with toilet/Shower and roof vent. 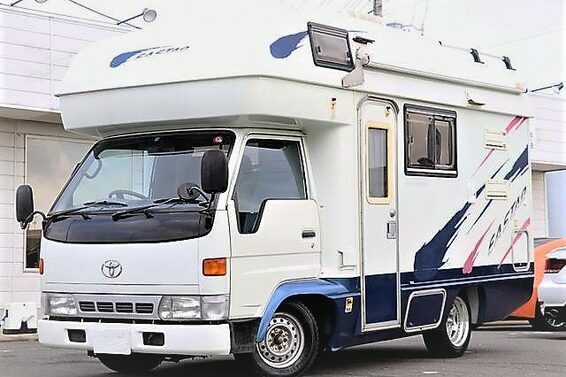 This is a very spacious and smooth driving motorhome and would be perfect for you. All the windows are pop out type unbreakable perpex with blackout blinds and fly screens. The fridge is 3 way. $48,750. Toyota Camroad Lotus model Click on photos for full size.